I think we all essentially anticipate the Cleveland Browns landing the top overall draft pick by season’s end. Sure, things could change between now and then, and with the team continuing to at the very least scrap with every opponent it faces, a win or two doesn’t seem outside the realm of possibility. Still, if the Browns don’t grab the No. 1 pick, rest assured they’ll at least be drafting very high come spring. The assumption since well before this season even started was Cleveland’s likely top five draft pick would be used to nab a quarterback. 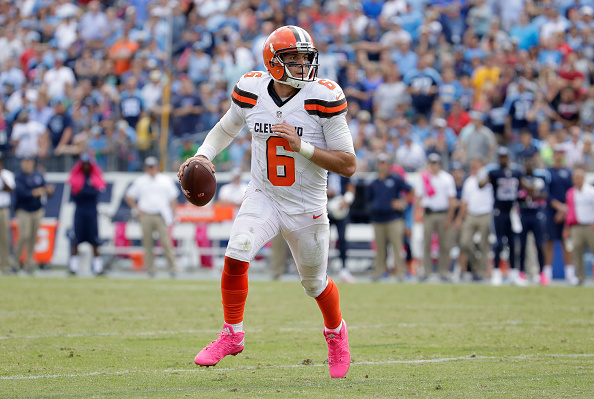 This belief was unchanged even after the Browns picked former USC Trojan Cody Kessler this past draft, and even after coach Hue Jackson insisted everybody needed to trust him with said selection. Surely the accurate-but-weak-armed Kessler wasn’t going to be Cleveland’s long-term solution at QB. The idea of him being a quarterback-starved team’s answer was novel, but the consensus thought was someone like Clemson‘s Deshaun Watson or Notre Dame‘s DeShone Kizer would be wearing orange and brown next year regardless of Jackson’s praise. As we know, Cleveland’s plans this year took a huge blow after Robert Griffin III and Josh McCown each suffered injuries in the first two weeks, forcing Kessler onto the field way earlier than planned. However, the end result of this might have changed more than just the Browns’ plans for this year. In fact, to the surprise of many, Kessler’s play may be changing Cleveland’s strategy for the next draft. I want to preface all of this with the fact I am in no way convinced Kessler is franchise-quarterback material, at least not yet anyway. If his season ended this week (not a far-fetched thought considering how the year has gone for Cleveland), I think Jackson would be rightly skewered for passing on a quarterback with the 2017 first pick. That said, in a season which we were told to expect a raw and completely unready Kessler on the field, we’re seeing anything but. Instead, we’ve seen a quarterback many claimed would be a deer in the headlights show off a surprising level of poise. Though concerns about his arm-strength haven’t been quelled, Kessler has shown an ability to work around this drawback. He’s excelled at going through progressions quickly, making sure to make the smartest throw as opposed waiting on his first read to get open. Additionally, his trademark accuracy has followed him from college to the pros, as his 65.6% completion percentage tops Pro Bowlers such as Aaron Rodgers, Cam Newton and Andrew Luck. Though the latter three QB’s have more pass attempts than Kessler, it’s still quite impressive when you consider what Cleveland’s rookie is working with. Remember, Kessler is playing behind a battered offensive line, missing both rookie wideout Corey Coleman (broken hand) and Josh Gordon (rehab). Last week, with the Browns’ running game stalled out, he was tasked with carrying said depleted offense, and responded by throwing for 336 yards and two touchdowns. Helping Kessler’s cause further is the fact neither Watson or Kizer haven’t quite put forth seasons which would result in their being labeled a can’t miss prospect. Watson has been uneven so far this year, while Kizer’s sparkling debut against Texas has been followed by a steady decline in performance. Should this trend continue, along with Kessler’s progression, the Browns may feel a level of comfort at quarterback which allows them to target other positions of need with their top pick. Of course, there are still outstanding issues which need to be addressed in order for us to reach that point. For one, Kessler has to survive the rest of the year. He’s already recovering from a rib injury, and if the past few games have indicated anything, he’s going to face a ton more pressure playing behind Cleveland’s line. On top of this, we’ve yet to see how Kessler looks playing in the brutal Northeast Ohio winters. Though he’s overcome arm-strength concerns now, things will change when he’s throwing in the blustery December winds which can make you struggle in a hurry. If he hopes to be a franchise quarterback in Cleveland, he’s going to have to be able to survive this situation. We’ll see how Kessler performs in that setting once (if) he gets there. To this point, though, he’s already looking like a surprisingly solid selection for Jackson and the Browns. If this trend continues, Cleveland’s assumed plans to draft a quarterback first overall next spring might not be so necessary after all.